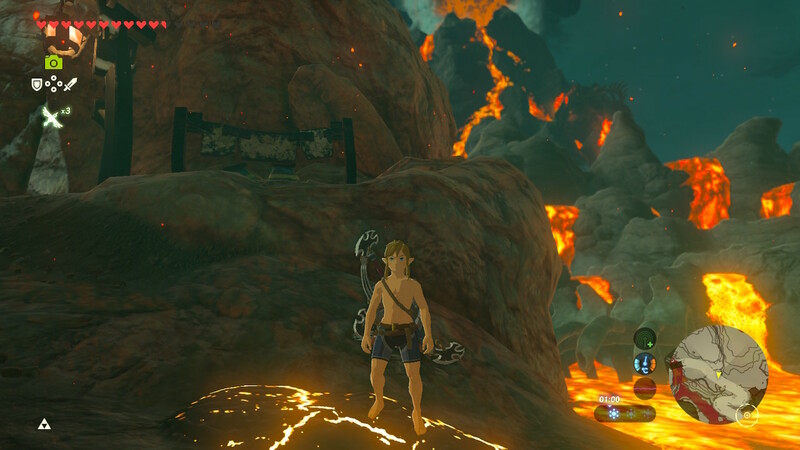 Yesterday, you may recall we posted a guide on how to max out your hearts and stamina in the Legend of Zelda Breath of the Wild. This guide used a bug called ‘Apparatus Storage’ to allow for this, and worked because the game still thought you were in the shrine even after loading an older save, letting you carry over your current health and stamina in the process. However, what we didn’t mention is that this… isn’t the only interesting thing you can do with Apparatus Storage. Oh no, this glitch actually allows for a crap ton of exploits even outside of that too! Such as one of our favourites. Turning off the annoying climate/temperature effects in various areas. For instance, have you ever wanted to explore Death Mountain without worrying you’d catch fire? Climb Hebra’s peaks without needing to wrap up warm? Or heck, take on the entire game in your boxer shorts without needing any other clothes at all? If so, you’re right in luck with this one! Because as it turns out, activating the glitch actually disables all temperature effects altogether until you warp or reload your save. This means that you can now stroll right up Death Mountain without any specialised armour or elixirs at all, and climb even the snowiest of peaks without a care in the world. Even lava doesn’t do anything to you now! And that’s not the end of it either. Oh no. Temperature and weather like hazards are ineffective in this state too. This trivialises a large portion of the game’s shrines. For example, any shrines with fire as an obstacle are rendered ineffective if played while this glitch is active. Same with those in Gerudo Desert focused around electricity. Who needs shock resistance anyway? It also means fighting enemies in the field is a bit easier too. 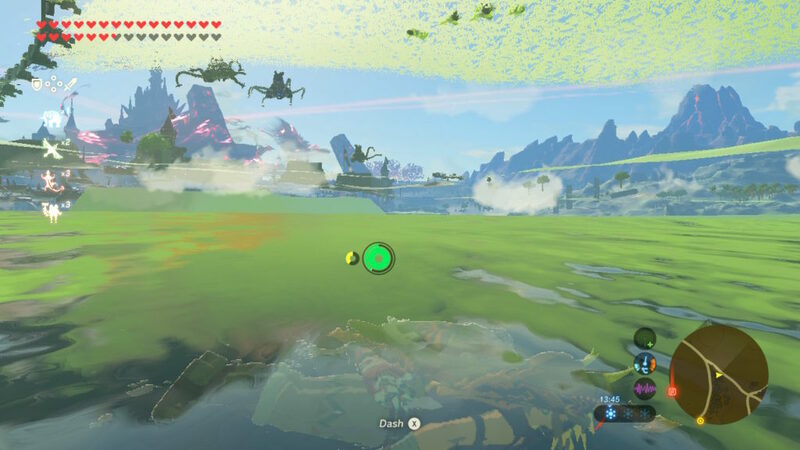 Not having to worry about the temperature makes dealing with Chuchus, Keese, Taluses, Lizalfos, etc significantly easier, since their elemental attacks and properties do nothing to you in this state. This makes it very much worth it to take on those Frost and Igneo Talus bosses with the glitch active, since you won’t need the Flamebreaker armour or Snowquill set to stand on them safely. Additionally, it also means that Guardians now do less damage, since a decent part of their laser’s attack power comes from the fire attribute associated with it. That’s why the Flamebreaker armour is apparently slightly better than the Ancient armour for minimising damage when maxed out, and that’s something that’s flipped on its head when this glitch is active. Outside of enemy damage evasion, this glitch has a few other perks too. Like potions carrying over with it like the environment effects. This allows you to set up say, an attack or defence potion, then use it on a previous/future save slot. 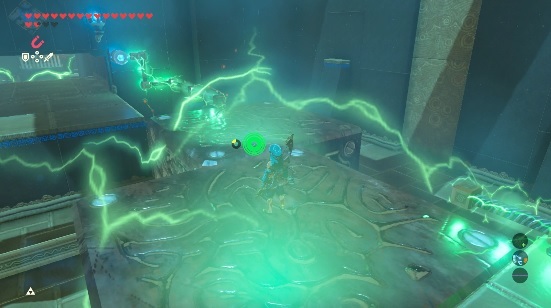 Interestingly, unlike the other effects, the transferred effect works exactly like it would if used anywhere else, only going away when the timer runs out rather than when you reload/enter a shrine/reset. And yes, if you were wondering, you keep your food/elixir from before. So it really is basically an infinite supply of free attack/defence/speed/whatever up food or elixirs that can be transferred back and forth in time. However, the insanity… doesn’t stop there. Oh no, this glitch has some very interesting effects that really break the game wide open. You immediately die and get warped to central Hyrule for some reason. At first, this didn’t seem too useful. After all, you’re placed below the ground in water you usually cannot escape from, and you have very limited control over where exactly you end up. 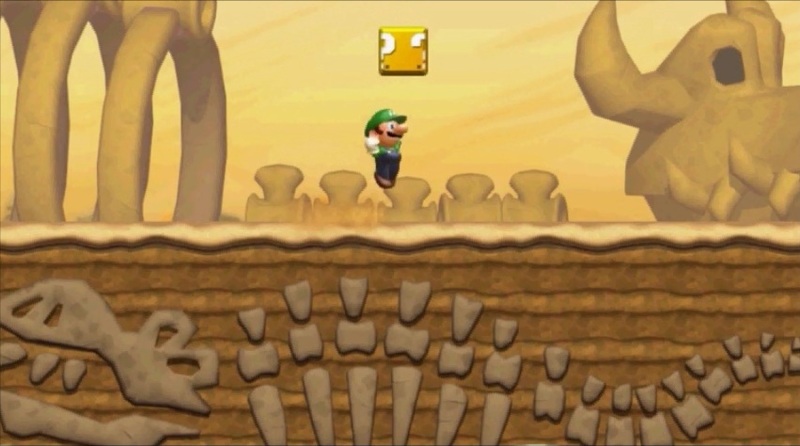 But then… we realised that this bug can also affect a file that hasn’t gotten off the Great Plateau. And as anyone who’s experimented with the game knows, the Great Plateau is surrounded by a giant kill box if you haven’t gotten the Paraglider yet. And it continues to get neater from there. Remember, you can also transfer your hearts and stamina to this new file too. Usually that means it’ll get removed when you reload, warp or enter a shrine, but if you’re careful, you can transfer it to a save made after the first four shrines are complete, then sprint full pelt to Hateno Village and activate the Horned Statue, permanently bringing all your upgrades over to a brand new save file. This basically lets you build your own New Game Plus for Breath of the Wild, and see how various early areas, bosses and dungeons handle with endgame level health and stamina. It also lets you grab the Master Sword right after the Great Plateau, and get up to 124 extra Spirit Orbs that you’ve now got nothing to do with. Alternatively, you can also just grab the Master Sword without locking your hearts in, then end up doing a 4 heart run with the sword despite not officially having anywhere near enough health to wield it. Or hell, maybe even upgrade it early too. Quite fun having a 60 damage weapon right off the bat, especially if said weapon is virtually unbreakable. And when you think about it… this glitch and all its setup actually goes really well with this New Game + setup. Think about it. You’ve got no Sheikah Slate, so you can’t teleport, being used with a glitch whose effects vanish if you teleport. It really does provide the perfect setup for an amazing Hyrule Castle run, a thirty heart + three stamina wheel ordeal armed only with the Master Sword and your underwear. So give the glitch a try sometime soon. It really opens up a ton of possibilities in the game, and allows you to do all sorts of crazy status transfer shenanigans and skips that you’d never be able to do otherwise. Help, my new hearts/stamina went away! Yeah, that’s expected. By default, any transferred hearts or stamina will vanish if you warp, enter a shrine or reload the save file. That’s why you have to speak to the Horned Statue and transfer them over. By doing that, you ‘bank’ them, and save them in a place in the game’s memory where they’re not reset when the glitch is over. So they’re permanent when you withdraw them from the statue? Yeah. Withdrawing the stored hearts/stamina permanently saves them to your file. Ah, okay then. What happens with other Spirit Orbs I might collect? Nothing. Goddess Statues won’t let you use them if your hearts and stamina are maxed out. This means any Spirit Orbs collected after maxing your stats with this glitch will just remain in your inventory. Are there any pitfalls with this system? Kinda. Apparently if you have max hearts, then try and withdraw even more from the statue, the counter will reset to four. Yeah, but it’s not as bad as you think. Remember, you’ve got a bloody glitch that lets you get infinite heart containers/stamina vessels. Even if you did end up in this situation, you could just transfer back/forward even more hearts or stamina. Or just reload the save file. Or not talk to the statue once it’s full. Hell, maybe even stop cloning hearts/stamina once you’ve maxed out. There are loads of options there. Can you get the Master Sword early with this? Are there any weird effects from doing that? What actions reset this glitch anyway? Going into a shrine, going into a Divine Beast, entering the Trial of the Sword, loading a save file or teleporting deactivate the glitch. Nothing else resets this glitch. It means any hearts/stamina you haven’t permanently saved to your file go away, the glider and Revali’s Gale work as expected again and… food/elixir effects aren’t affected. Yeah, those bonuses you get from food or elixirs don’t seem to go away when the glitch is deactivated, they just work on a timer like they would normally. Okay then. What does skipping the Sheikah Slate do then? But runes, Sheikah Towers, shrines, terminals and other things usually requiring the slate do work, and act like you have it. You can also get the slate back by heading to the Shrine of Resurrection again, which will play the cutscene that gives you the item. How does this displacement thing work? Why do you warp to central Hyrule if you fall off the platform in the apparatus shrine with the glitch active, then load a save slot? Put simply, the game doesn’t register the pit you’ve fallen into, since it thinks you’re controlling the motion control apparatus. When you load another slot on the other hand, it remembers that you touched/passed the death plane, and immediately voids you out. As for why it sends you to Central Hyrule… who knows. Presumably the shrines are all placed there in the alternate map they use, so the game is trying to send you back to the platform you fell from. And why the weird happenings on the Great Plateau? The Great Plateau is surrounded by a death barrier. If you’re outside of a certain set of coordinates, you contact this barrier, void out and appear on the Great Plateau. 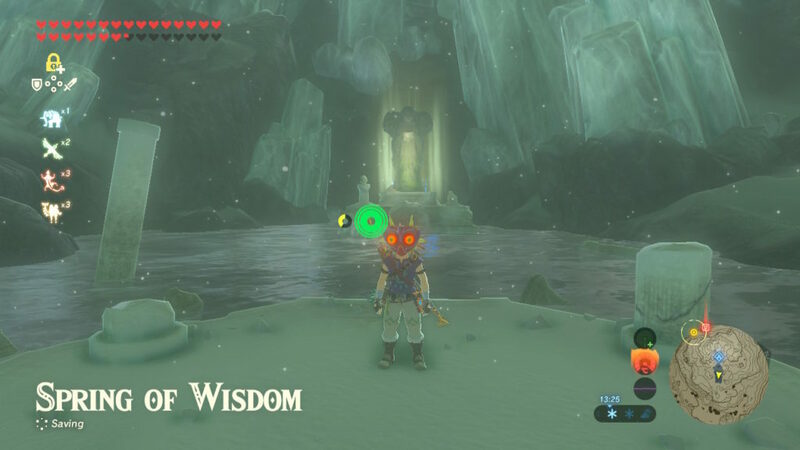 By activating the glitch, the game first puts you in central Hyrule (where it expects the shrine to be), then you hit the death barrier around the Plateau, which in turn respawns you outside of the Shrine of Resurrection (since that’s the first place the game has set up for a valid respawn point). Why is time locked at 5:30? The cutscene where Link runs out of the Shrine of Resurrection also starts the in game clock. That’s why clipping out of the shrine will also freeze time. What happens if you use the void out glitch in a Divine Beast? You reload in various odd places. In Vah Rudania, that’s underneath the floor. The exception is the Final Trial, which always respawns you in the centre room. What about if you load a shrine? The void out part of the glitch doesn’t work in shrines, since the elevator/lift cutscene overrides it. All other aspects do though. What can’t I survive with this glitch active? 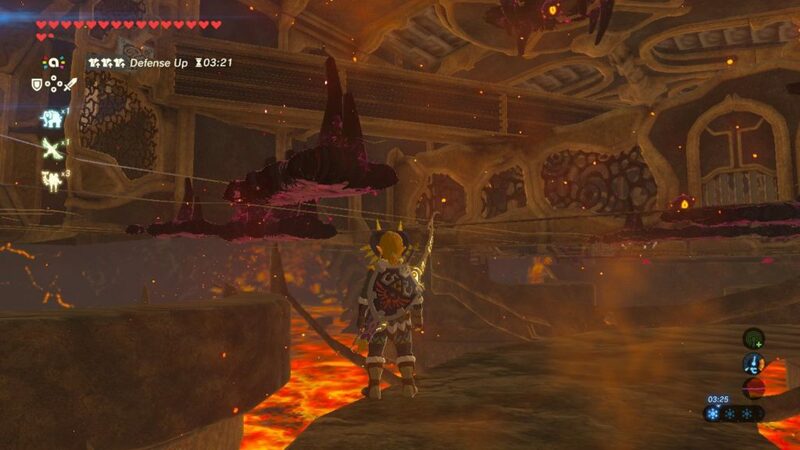 Bottomless pits, lava, freezing water, lightning bolts and (likely) Vah Nabooris’ lightning attack all still damage you/cause you to void out. Why doesn’t my glider work? Part of the glitch screws up glider physics and Revali’s Gale. Those act a lot more… realistically. Why am I stuck moving the gyro apparatus in third person? You played two memories when starting the glitch. If you’re unlucky, you’ll get locked in place and stuck moving the gyro and camera at the same time. Finally, can this glitch damage my save file? No. As per every other glitch in this game, it’s virtually harmless. I’m slightly confused on how to transfer the hearts and stamina permanently to a new game. So would you need to use an autosave from after getting off the Plateau, load the manual save file from later in the game and use the glitch to max everything out, then load the autosave from after the Plateau and transfer and withdraw everything to the Horned Statue so you can get enough permanently have maxed vessels?